← Wardrobe essentials: what are they really? it is very comfortable – I would like to live in it. In cooler weather I live in cardigans. A dress suitable for wear under a cardigan should ideally have a plain neckline. And also long sleeves to keep my arms warm. So really, a long-sleeved T-shirt dress, right? Yes, I know I said I didn’t care for T-shirt dresses on me. I’m calling my own BS here with this project. Here’s how I wore it to the commissary this morning. Notice the lime green scarf and if you look closely enough, you’ll see those peridot earrings in action, too. And did you see the peridot torsade necklace in the pictures above? The pattern is a combination of KS3003 on the top and M6355 on the bottom. I had made it for the previous dress project and then didn’t use it. It really saved me time on this project. I notice in the picture below that there is a waist dart in the front, which I had apparently decided to omit (they’re not on my working pattern). It’s a good thing, too, because I doubt I could get into it otherwise. I did sew the waist darts in the back to give it a bit more shape. I pegged the hemline a little – I wanted a nice sleek look but still wide enough that it wouldn’t need a slit. And I sort of eyeballed the neckline, bringing it in a bit at the sides and up at center front from where it was for the foldover collar. Just a simple basic neckline. Black Sophia knit. Not much new to say here – stable knit, a dream to sew. Some people over at Stitcher’s Guild were wondering about pilling. I’m wondering too. Will report back after a few wears and washes. I had fixed the bust dart position previously and it is fine. I am still having some wrinkles around the armhole. It’s hard to show in these pictures because of the black fabric. 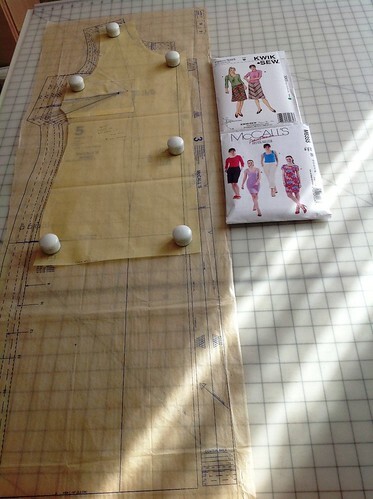 I may just try morphing a new armhole, maybe from Burda, onto this pattern. I like the shaping at the side seams. It keeps the dress from looking like a potato sack. Without a belt, the front looks kinda funny to me from the side. Belted is better. I like it a lot so far. With long sleeves and corrected armhole, this pattern could become a part of my winter uniform. I have a vision of me wearing T-shirt dresses with me-made belted cardigans, feeling comfortable and stylish all winter long. I like the new dress with and without the belt. But I think I’ve been influenced by your color scheme because my next make is from that black/green combination. Beautiful with and without the belt. Comfy casual without and when you add the belt, it’s like a whole new look. Very nice! Šaty sú parádne s opaskom aj bez neho a s tým šálom rozhodne. Ale tie gorále? Nie k tým šatám. K nim sa žiadajú nejaké dlhé. This looks great on you! It’s good to see a t-shirt dress that can look chic. A good wardrobe staple adaptable to any season. Wow, the dress is so beautiful and elegant! Awesome dress! I’d be so curious to see it side by side with 2 alternatives – a deeper scoop neck and a V-neck.